MAUI, HAWAII (MARCH 28, 2013) — Living on a beautiful Hawaiian island has obvious benefits. But when it comes to home-improvement projects, even an island paradise can present major challenges. Kathy O’Brien has discovered this first-hand. Over the past 11 years, the retired commercial airline pilot has renovated three homes on Maui, each time facing down one of the biggest and most common home-improvement obstacles: no simple or inexpensive way to install conventional plumbing. O’Brien’s plumbing situation was much the same as mainland homeowners who want to add a bathroom in a basement or garage or on a slab. 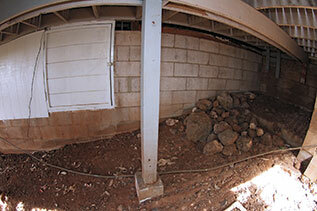 No matter where you live, digging through concrete (or rock) is costly, time-consuming and very messy. O’Brien first encountered this challenge when she helped her father update a spare bedroom and bathroom in his two-story island house in 2001. There was a McPherson up-flush toilet on the lower level that had worked well for nearly two decades, but needed replacing. The toilet’s manufacturer was out of business and local contractors kept steering O’Brien toward the installation of a sewage ejector and a holding tank. That concept didn’t appeal to O’Brien, especially the need to pump out the tank regularly. Plus, she couldn’t dig through the volcanic rock to bury the tank in the yard. Undaunted by the prevailing local advice, O’Brien was determined to avoid the sewage ejection system. When she read an ad in a magazine about macerating plumbing systems from SFA Saniflo in Edison, N.J., she thought she was on to the solution. She called the company herself and subsequently purchased a unit through a local dealer. The Saniflo up-flush toilet looks much like a conventional model, but discharges effluent out its back – rather than out the bottom to a below-floor drain. 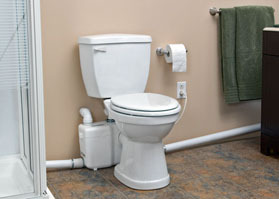 With an up-flush system, waste and water are routed to the macerating device, housed in a highly durable enclosure set behind the water closet, either in front of or behind the wall. The macerator uses a fast-rotating cutting blade to turn waste and toilet paper into fine slurry that is quickly discharged under pressure through small-diameter piping into a septic tank or sewer system. Both the fixture and the enclosed macerator are installed directly on top of the floor, while the discharge piping – like the macerator – can be positioned in front of or concealed behind the wall. The system can also handle wastewater from a sink and a tub/shower. Not having to install a below-floor drain line avoids the expensive, time-consuming chore of breaking through concrete or – in O’Brien’s case – volcanic rock. With macerating systems, walls and floors remain intact, and installation is accomplished quickly and economically with minimal disturbance to room layout. The system can be fully operational within a day, says Joe Sakofske, manager of Advance Plumbing and Heating Supply Company in Walled Lake, Mich., a member of Saniflo’s nationwide network of wholesalers and distributors. Four years later, in 2005, O’Brien turned to Saniflo after purchasing the house next door to her father’s and renovating it as a rental. 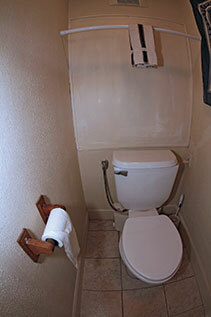 The house had a lower-level studio, but no private bathroom. “I knew I could charge a higher rent with a Saniflo installation,” O’Brien says. At the time, macerating plumbing was still an emerging technology on the island. Because her local dealers were more familiar with sewage ejection, she tapped into Saniflo’s nationwide network of wholesalers and distributors. Working through Sakofske’s company, O’Brien this time bought a Sanibest model to handle the bathroom sink and tub-shower. The most powerful of Saniflo’s products, the Sanibest is a high-performance, one-horsepower grinding system constructed from hardened steel that can easily handle larger sanitary articles, as well as waste and toilet tissue. That makes it ideal for rental properties. 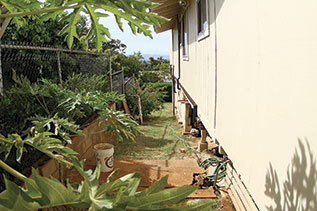 By the time she bought the third house in Maui in 2010, O’Brien had the macerating plumbing process down to a science. She decided to add a bathroom to the home’s lower level office and, once again, knew Saniflo was her best option. For this install, she purchased a Sanigrind. Like the Sanibest, this model can pump effluent vertically 18 ft. and horizontally 150 ft., easily reaching the sewer connection on O’Brien’s street. To that end, Sakofske holds two to three training opportunities for his customers each year. “We introduce contractors to Saniflo with smaller projects, such as installing a wet bar in the basement,” he says, adding that time- and cost-savings are a big part of his presentation. To download a hi-res image file, click on the desired image or file name and a zip archive automatically downloads to your computer. Due to how various browers handle downloads, you may have to expand the zip archive manually. Images are 6" x 4" (1800 x 1200 pixels) x 300 ppi ; CMYK; unless otherwise specified. Larger sizes may be available upon special request. 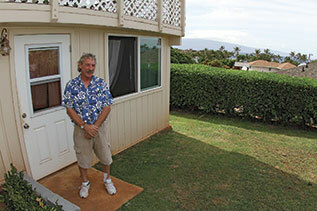 Homeowner Kathy O’Brien recently renovated three homes on Maui, HI. Tim Williams, installed a Saniflo up-flush toilet in this house, saving O’Brien the cost of excavation. “Where I live, it is solid volcanic rock beneath the yards,” says Kathy O’Brien. Costly, time-consuming digging for conventional plumbing just wasn’t an option for this homeowner. In Maui, many homes are built on a slant uphill and placed on piers. “The sewer lines are on the street above you, so you have to pump waste up,” O’Brien says, explaining why she couldn’t use conventional plumbing for her renovations. Whether through rock or cement, digging is messy, time-consuming and costly. 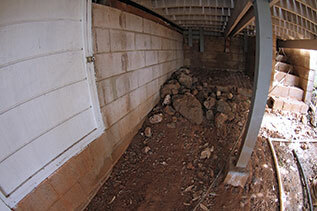 O’Brien chose Saniflo macerating plumbing to avoid breaking thru the volcanic rock beneath her homes. 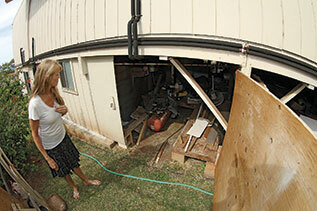 Here, Maui resident Bonnie Aeder notes the tight space beneath O’Brien’s home. Saniflo up-flush technology is a flexible option allowing installation to be accomplished quickly and inexpensively anywhere. Bonni Aeder gets a tour of Max Fuqua’s apartment. O’Brien renovated the home in 2005 with a Sanibest to handle plumbing. The Sanibest is the most powerful of Saniflo’s line, making it a good choice for a rental unit. The Sanibest is a high-performance, one-horsepower grinding system. In this home the macerating technology handles both the bathroom and kitchen plumbing. The Saniflo up-flush toilet looks much like a conventional model, but discharges effluent out its back, rather than out the bottom to a below-floor drain. 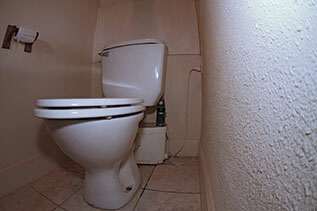 The macerator is located behind the toilet (it can also be concealed behind a wall). It uses a fast-rotating cutting blade to turn waste and toilet paper into fine slurry that is quickly discharged into a septic tank or sewer system. Like other models in the Saniflo line, the SANIGRIND up-flush toilet system can be installed anywhere in the home, without digging. 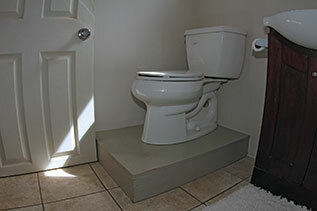 However, unlike most Saniflo rear-discharging toilet models, the SANIGRIND unit offers a conventional bottom discharge outlet, so the toilet itself must be set on a raised platform to allow for proper drainage. 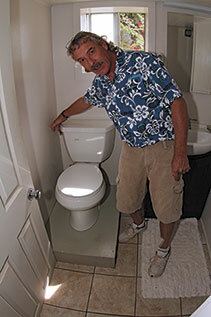 Tim Williams, installed a Saniflo up-flush toilet, saving homeowner Kathy O’Brien the cost of excavation. For her second rental property, Owner Kathy O'Brien selected the SANIBEST up-flush toilet system, which enables users to create a new bathroom wherever it is most convenient. The system can be fully operational in as little time as a half-day. 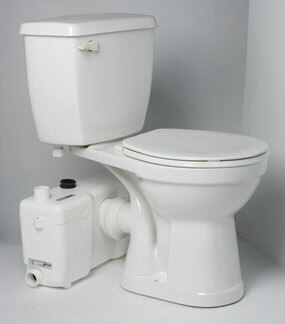 The most powerful of Saniflo’s products, the Sanibest is a high-performance, one-horsepower grinding system constructed from hardened steel that can easily handle larger sanitary articles, as well as waste and toilet tissue. That makes it ideal for rental properties.